On this screen, VCDS shows you any DTCs (�Diagnostic Trouble Codes� or Fault Codes) present in the control module in which a communications session is currently active. VCDS shows the DTC numbers and also decodes each DTC into meaningful text. At top of the screen is shown the VAG Number and Component number as found on the Open Controller screen. 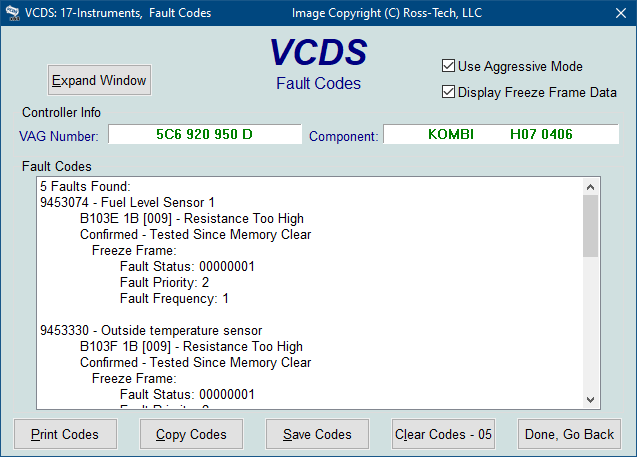 VCDS tells you how many fault codes have been found and displays each of them. The 4, 5, 6, or 7-digit number is a standardized VAG fault code, which can be searched in the Factory Repair Manuals. On newer control modules using the UDS protocol, the number of digits may vary. The text is a description of the part and failure mode. The letter and number combination in parentheses is the Component Identifier. This is followed by elaborators describing the condition of the fault. The second line contains the P-code, or generic OBD-II code (if it exists -- there are thousands of VAG codes without generic OBD-II equivalents) along with additional information about the fault if available. The Use Aggressive Mode checkbox applies only to UDS/ODX modules and is checked by default. When checked, VCDS will retrieve more faults than even the factory VAS tools in some cases. Uncheck this if you wish to correlate VCDS results with results from a VAS used in manual (non-guided functions) mode. The AutoScan function always uses Aggressive Mode. The Display Freeze Frame Data checkbox adds Freeze Frame data for Fault Codes on control modules using the KWP-2000 or CAN protocols. Keep in mind that many control modules are not aware of the actual date and time, so they may display bogus dates, just as they do with the factory scan tools. Note: Not all control modules fully support this. As a rule of thumb, cars which were re-designed after 2003 will likely have some control modules that support it, and older designs will not. There's no harm in leaving this enabled in any case. However, un-checking it can make the results less cluttered in a scan which contains many fault codes. In vehicles that do not support Freeze Frame, that checkbox will not be present. 1 The fault has a strong influence on drivability, immediate stop is required. 2 The fault requires an immediate service appointment. 3 The fault doesn't require an immediate service appointment, but it should be corrected with the next service appointment. 4 The fault recommends an action to be taken, otherwise drivability might be affected. 5 The fault has no influence on drivability. 6 The fault has a long term influence on drivability. 7 The fault has an influence on the comfort functions, but doesn't influence the car's drivability. Fault Frequency shows how many times the conditions that caused the fault have recurred, during all driving cycles. So, if you have a fault with a Frequency of 11, then conditions sufficient to trigger the fault have happened 11 times since the fault was stored. The counter can have values from 0 to 254. It is incremented with each occurrence of the fault (during all driving cycles). The Reset counter is a number that has been pre-assigned to each fault, with the number of problem-free driving cycles before the fault presumably clears itself. Each time a driving cycle occurs, and the conditions sufficient to trigger the fault do NOT occur, then the reset counter should go down by one. So if you have a fault with a Reset Counter of 40, if the controller goes through a problem-free driving cycle then that number should go down to 39. [Print Codes] will print a Fault Code Printout. If your PC is not connected to a printer when this button is pressed, be sure to use Windows to set the printer to "Work Off-Line" first! Later, when you connect the PC to a printer, un-check "Work Off-Line" to print the report. [Copy Codes] will copy your fault codes to Windows Clipboard. Once you have pressed the Copy Codes button, you may paste the results into the application of your choice, such as MS Word or Notepad. [Clear Codes - 05] will send a message to the controller asking it to erase the DTCs from its memory. Some faults cannot be cleared (such as internal processor faults) and the control module may explicitly refuse or may just still display the fault after a clearing attempt. Be aware, clicking on Clear Codes does not fix the problem that caused the fault! DTCs should only be erased after correcting the condition(s) that caused them in the first place. Note: There is no way to erase individual DTCs while leaving others alone. This is not a limitation in VCDS. It's just the way the VAG protocols work. Note: In some cases, the ignition must be cycled after clearing codes but before performing certain functions such as Basic Settings. [Done, Go Back] takes you back to the Open Controller Screen where you can select other functions.